This one's a dead ringer for one of those nineties lukewarm rock ballads. You know the kind. A faceless band with a generic frontman singing a plaintive love song that relies on pounding guitars for its intensity. It's their one hit that gets played everywhere, but nobody buys the album because it's just going to pop up on some late-night hits collection anyway. But it's 2012, and this is a single from someone who's supposed to be country music's premier male singer. That fact alone should make the mediocrity of “Over” quite remarkable. But who are we kidding? Mediocrity is enough to get you in the winner's circle these days. 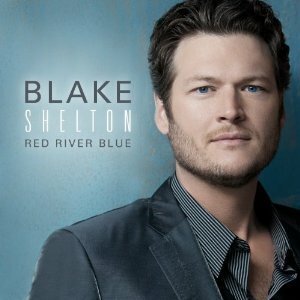 Blake Shelton's doing well in this climate, and this song will certainly follow his previous singles right up the charts. But country music is in trouble. Its enthusiastic embrace of Shelton and many of his contemporaries as the best it has to offer sounds an awful lot like its death rattle. When it's no longer expected that our core acts sound country or sound good, how much longer can the genre survive? If I could put it this way: I’ve had the album “Red River Blue” for a good while now and I’ve yet to listen to this song through fully without skipping it. For just one brief moment before reading the review, I was holding out a shred of hope that this might be somewhat good. Oh, how Shelton depresses me these days. I wonder how long Blake can get away with releasing one mediocre single after another? Sigh. Why can’t he release the title track instead? Boring song I agree. The last BS single I liked was the “Not Looking” song which I already had by Joe Nichols. Before that it was his cover of Michael Buble’s “Home”. Choosing quality, original material is not BS’s strong suit. But as you indicate, he doesn’t need to make the effort. Kevin – I really like your writing, but you’re being a bit dramatic. Blake’s crappy output lately also coincides with his increased mainstream popularity. I don’t think it’s county’s core audience who is newly embracing him, do you? I feel Miranda is also heading down this same road. I can’t even listen to “four”. I think you’d have to be deaf to think THAT’S an improvement over her earlier releases. I guess my point is that it’s the soft pop enthusiasts who are eating this stuff up. It’s just a minute or two on the radio that you can ignore by hitting the “CD” button. I keep a good record (usually it’s “Welder”) in my player for songs such as this. Thank you for such a well written review, Kevin. This song is terrible, and the effort (or lack thereof) Blake puts into anything but the Voice these days is disheartening. Folks might have jumped onto Eric Church for his statements (which, I found to be right on target), but this lukewarm attempt at music is exactly what he was speaking of. I don’t mind Eric Church having an opinion. But he expresses it in such a rude way. And worse, he is guilty of many of the sins that he and/or his fans and/or his marketing department seem to insinuate others are guilty of. I don’t dislike Church’s music. It seems pretty average for mainstream radio. There’s mainstream stuff I like more, and mainstream stuff I like less. But it does rub me the wrong way when Church puts on the “I’m a pariah, I’m an outlaw, I’m different, I care about art and they care about commerce and screw Rascal Flatts I’ll play my music loud” nonsense. I don’t buy it at all. I actually thought this was one of the better songs on the album. Not as ‘country’ as I would prefer, but I didn’t dislike it. Also thought that was a pretty strong line, but what do I know. I still sorely miss the old Blake. I think he’s just a victim of his own success. I know a song like Hillbilly Bone was panned by pretty much everyone, but could you even see him releasing a song like that nowadays? Doubtful. Given Shelton took Conway Twitty’s 1988 Top 10 hit “Goodbye Time” to the Top 10 himself 17 years later,I am surprised more of his musical output is not listened to with that huge musical influence in mind. So much of both Twitty and Shelton’s music is bombastic and bawdy. I thought “Drink on It” was the kind of creepy, predatory song Twitty so effectively growled his way through without apology years back. “Over” represents the bombast. It explodes with the urgency, not only of the pounding guitars, but the entire production package. It is a big, gross number that works to my ears because there is total buy-in by the vocalist. I don’t understand how one can accuse Shelton of not trying. I have listened to the song several times through and it is simply not a phoned-in vocal performance. You may not like the song, but Shelton is bringing it vocally. Criticism needs to come from somewhere else. Sonically, “Over” reminds me of Twitty’s later hits like “She’s Got a Single Thing in Mind” and “Who’s Gonna Know.” I love Shelton, if for no other reason, than you can connect the musical dots with him. Like Twitty, Shelton is comfortable navigating the waters of both pop and country. I am confidant that any one of his recent number ones will be worthy fodder for future Retro Hit analysis. What a blah song. And programmed drum beats? C’mon Blake you can do a hundred times better. Of course, he’s at the mercy of songwriters. Grumpie said “Of course, he’s at the mercy of songwriters.” How so?